A deep gorge cut by the flowing waters of the Colorado River, the Grand Canyon is located in Grand Canyon National Park in the state of Arizona. Grand Canyon is easily accessible by road from US Interstate-40 or by air and road from Las Vegas Airport or Phoenix Airport. Visitors come just for the view, but many stay and enjoy exciting activities such as whitewater rafting, nature hikes, or donkey pack tours. The south rim is the most accessible part of the Grand Canyon while the north rim is a bit more rugged. Guided helicopter tours are available to take in the entire view, or you can breathe in the expanse from the skywalk at the western rim. If staring down through a cantilever glass structure is not your taste, then perhaps a tour of the Hoover Dam would suit you. At the time of construction, the Hoover Dam was the world’s largest ever concrete construction project, and many new techniques were implemented in the dam’s construction. Lake Mead created by Hoover Dam provides abundant recreational opportunities including waterskiing, fishing, and jet skiing. 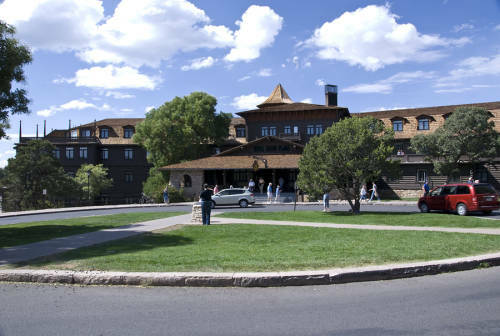 The award-winning Grand Canyon Plaza Hotel is in close proximity to the park entrance. The full-service hotel features an on-site restaurant, seasonal swimming pool, and an indoor spa. Experience luxury camping at Grand Canyon Under Canvas. Located just outside of Valle, Arizona a little over a half an hour drive to the Grand Canyon National Park. Yavapai Lodge is located by the Market Plaza, which includes a general store, deli, bank, and U.S. Post Office. In addition, the lodge also features a cafeteria that is open for breakfast, lunch, and dinner.